There are a lot of amazing destinations that you can travel to throughout the world. At times, it may seem like we live in a small world with all of the communication devices that we have. But when you get outside of your normal environment and travel to different destinations throughout the globe, you realize just how small we are and what fantastic places there are to discover. In this blog, we want to touch on some of those simply breath-taking vacations destinations, so you can get a glimpse and take a trip to see it for yourself. Just looking at the picture of this natural formation is amazing. The rock is a granite cliff that is 50 metres high and approximately 300 feet long. What makes this rock formation so unique is the fact that is in the shape of a wave that you would see in the ocean. The cause of this is weathering over the years from wind and water eroding underneath the cliff. One of the best times of year to travel here is in the spring. Wild orchids and other flowers grow around the base of the rock formation in the Sheoak trees. This hotel destination was voted one of the best destinations to travel to in the world. You may ask yourself where are the Maldives? The Republic of Maldives is an island country just below India in the Indian Ocean. What makes this destination so amazing not just the crystal blue waters, palm trees and white sands to relax on during the day. They have swimming pools that go right up to the edge of the ocean and a very relaxed dining room that is one of a kind in the world. It is completely underwater with a dome shaped room that has the ocean life swimming around you as you dine. This is one of the vacation destinations that is great for lovers. Ocho Rios is one of those places that you can go as a couple and fan the flames of love and passion. There is excitement around every corner. 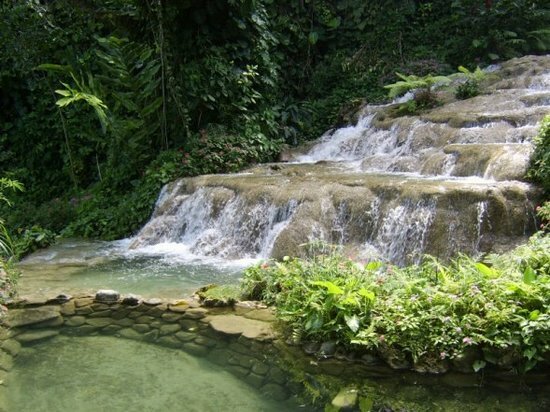 Here is a quick romantic lover’s guide to Ocho Rios. Mix and match all of these places and things to do to create your romantic getaway for the perfect couples vacation. The Monasterio de Santa Catalina has an amazing history and even more magnificent building and ground to explore. Most people that visit here are deeply moved as they explore the warm and cozy monastery. It has a very rich history of the nuns that lived and worked there many years ago. The monastery is located right near Arequipa city. Besides the beautiful passageways and incredible gardens, the city of Arequipa has many sights to see and enjoy.